As we continue our love of the great outdoors this summer, we wanted to draw your attention to helping children become nature observers. Be sure to point out the ways animals hide or camouflage themselves. Ask children to think and explain why this is important. Help them to see creatures in the grass, in the water, in fields, or even in the mud as they become keen observers and critical thinkers. We spotted this frog in the muddy water along a walk. When you see a frog in a place like this, a few probing questions can lead children to consider the wonderful ways of natural camouflage. You might ask, "Is it more difficult to see this frog in the muddy creek than in the green grass?" Listen and ask follow-up questions like, "How does blending into the creek help this frog?" When walking in a different habitat, you could spot an animal like this toad hiding in the grass and dried leaves. This yields a discussion about why certain habitats are more inviting for animals than others. Ask children questions like, "Why does this environment protect the toad more than grass that was all green would?" You may want to imagine the view of this toad from a treetop. Pose questions like, "What animal might try to eat this toad? How would its coloring in this habitat protect it?" These help children to think about scientific concepts. Hold 'grand conversations' and follow-up with children's responses. Take the opportunity to spot nature "at work." Then what may be scary to children, like this harmless snake, can become a normal and accepted topic for a discussion about the wonders of the environment. Children may be more likely to consider ideas like the snake's coloring and how this helps it, then be fearful of its presence. These are just examples from our part of the world. What camouflage can be seen in animals where you live? These kinds of observations and prompts will encourage an appreciation for nature and will develop oral language along with encouraging critical thinking skills. Walks anywhere can be fun for classrooms, summer camps, and families. When you have a chance to walk in a park or along a woodsy pathway, you can encourage thoughtfulness about nature with children. What may seem like a simple sight to you, can provoke age-appropriate critical thinking for children. For example, the stem of a dandelion, with an empty stalk and flower head can be the source of questions. "Why isn't this dandelion yellow anymore? What happened to the seeds?" These kinds of discussions can help children develop analytic thinking skills and to "think like a scientist." You may see a dandelion in bloom, one with its fuzzy head, and another with just a stem. This is a perfect scenario for discussion and questioning. Stop to examine a tree on the ground. Is its trunk cracked? Is it uprooted? Pose questions like this to spark curiosity in children. Encourage them to make connections between a recent windstorm and the observations they make on a hike. Talk about what happens to animals that might depend on the tree. Did the squirrels 'scurry' off somewhere else? When we question like this, we are developing a sense of concern for nature. A walk on a sandy shore line or dirt road might yield animal tracks that can lead to more questions. "What do you think was here? What were they doing?" Asking children to imagine and make hypotheses based on these visuals helps raise curiosity about nature. Asking questions like, "What do you think made these tracks?" helps heighten curiosity about nature. Walking along a sidewalk? Stop (at a safe distance) to look down at an anthill. Discuss the build-up of sand around the opening. Ask children to verbalize how this might have happened. You may see streams of ants busily going to and from the hill. Ask children to describe what is happening. Then encourage them to use interesting words (see the blog post titled Colorful Words) to connect language arts and science. Even an anthill, lodged between sidewalk cracks, can lead to important nature discussions. These kinds of discoveries can open a world of inquiry about animals and their habits. The child who was lucky enough to spy this, returned home full of questions about beavers. His family found several YouTube videos so that he could watch and then answer his own questions, based on the observations made from viewing the videos. Wonderful Wildflowers Provide Sequencing Lessons! There are so many wonderful opportunities that nature gives us. A bonus is that not only do our children develop an appreciation for our Planet but all of this is free educational material! We recently took a close look at the wild environment around us and made key observations. While the plants may be different in your community, the idea is the same - help children to discover how nature sequences the blooming of wildflowers. These blooms like to hide. You need to know where to look to spot these tiny wildflowers. In the northern forests and fields, one of the first flowers to bloom is the shy Mayflower or Arbutus. As soon as the snow melts, the blooms on this plant hide beneath the big leaves, close to the ground. Help children to discover the first wildflowers of spring in your area. Yellow Trout Lilies are "early risers" in the northern U.S. forests. Subsequent excursions, will show you that soon other wildflowers will follow. In our area, we next spot Yellow Trout Lilies and the Buttercup. What blooms next in your area? It is always exciting to spot a Lady-slipper! They are delicate! The appearance of these flowers means we should keep our eyes peeled for the elusive Lady-slipper wildflower. This gem can be difficult to find, but you will be rewarded if you know when to look. Watch for the blooming of the more common wildflowers for your signal to search for the Lady-slipper. Help children to discover which flowers mean that others will also be in bloom. Then, share the tale of this unique wildflower by reading the book, The Legend of the Lady's Slipper by Kathy-jo Wargin. This connection helps your budding botanists to appreciate the long history of wildflowers and the stories told by generations. Check for books, legends, and tales about wildflowers in your area! As the summer continues, look for other plants that bloom. Take photos and sequence these pictures to show the story of the growing season through wildflowers. This was not showing the child that he needed to take care of a pet. But changing the water and having it at the right balance was beyond the child's developmental level. The solution? We heard about fish tanks that demonstrate the interaction of nature. The waste created by the betta in the tank is pumped into the plant section. This waste helps the plants to grow and thrive. What a wonderful way to show children that in nature everything has a place - even waste! Since the waste is removed from the water, it is clean and clear, making the water a perfect habitat for the betta. 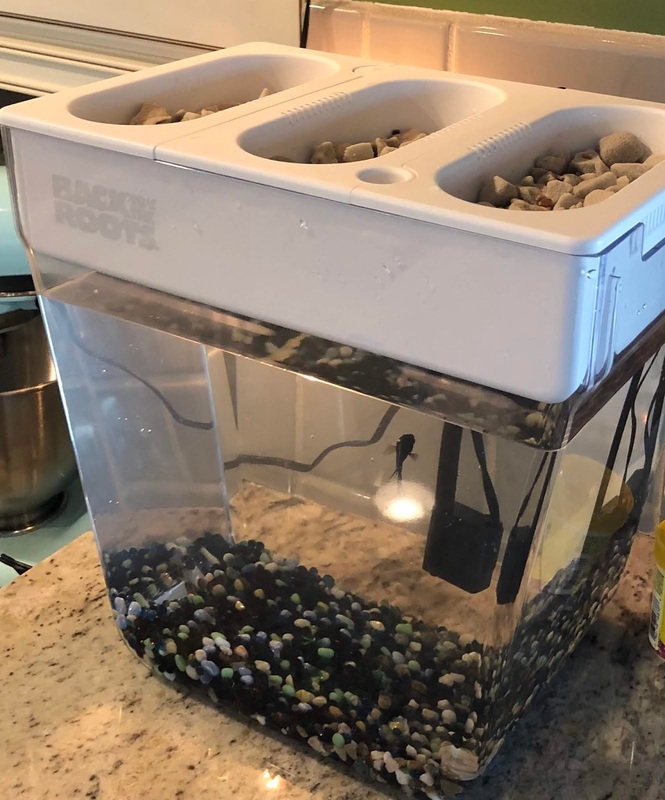 What's even better is the plants grow fast as they love the fish "food" that is recycled to them. Children have a fish that lives in a healthy environment, a garden, and a wonderful example of how an ecosystem works! Soon the plants will sprout. They are herbs and can be used in cooking. What an ecosystem where everyone and everything benefits! We like to encourage the use of interesting (colorful) words. This helps children expand their vocabulary. Research tells us that most students (not just young children!) learn more new words from reading books or having books read to them than through explicit vocabulary instruction. In fact, reading helps grow vocabulary more than 6 times as much as direct instruction. This is powerful and shows us that we need to read books to our classes and encourage families to share books at home. Of course, this should be done in any language. Unfortunately some families are hesitant to read to their offspring in their home language. We should advocate for this to take place as there are many benefits to hearing the language of literature and informational text. But there are fun activities we can do to heighten awareness of words and encourage word play, especially in homes over the summer. We like to use paint chips and talk about the progression from light to bright colors. This can seen below. We then find what we call a dull word. Examples include walk, said, good, mad, etc. The list can go on and on. We suggest doing the first paint chip activity as a modeling activity (see our post here) and then encourage children to keep a paint chip or two taped to a wall. They can add to the words on this paint chip as they listen to books or conversation around them. This encourages children to be good listeners and on the look-out for interesting additions to their age-appropriate thesauruses. Tell children they do not need to have all spaces filled in one day. Paint chip collections should be a part of a summer of oral language and word play. At the end of vacation, families can read the words together and choose their favorites. You can also encourage children to use the more colorful words in daily conversation. This is vocabulary development at its best! Have you noticed that children love counting? They especially love large numbers. Talking in terms of hundreds of something is a normal part of a young child's speech. You can help children better understand the meaning of one hundred and the progression (sequence) of numbers when you create a hundreds chart with them. This is something you can do as a group in your classroom and then suggest to families as a home activity. Children love recreating a school activity at home! As you write the numbers, be sure to use different colors to depict odd and even numbers. Keep the numbers in lines so that children can see those with 0 in the one's place, 5 in the one's place, etc. This can help them count in different ways, including skip counting (for example, counting by 2s). A simple homemade hundreds chart, like this one, is more meaningful to children than store-bought charts. You can involve children in creating charts. This makes memories! You can make several charts and cut apart the columns so children can see 5, 15, 25, 35, etc. Children can then put the hundreds chart back together again like a puzzle. This can then be done, using an additional chart, and cutting the rows apart. When children work to place these pieces back together again, it gives them a greater understanding of the way numbers work. For further understanding, use unifix cubes to make the numbers. We find children love to snap together the cubes to make long number "trains." These can then be matched with the numerals on your hundreds chart. Depending on the age and readiness of your children, you may want to discuss odd and even numbers. We hope you will use unifx cubes to illustrate the idea that even numbers can be evenly divided while odd numbers cannot be divided into "trains" of equal length. If your children are not ready for this concept, just using different colored markers for the odd and even numerals on the hundreds chart will develop some background knowledge and help them to become school ready! NAEYC – 2.C.03, 2.F.02, 2.F.04. Head Start – I.D, X.A, X.B. But My Child JUST Memorized That Book! So many times we hear family members say that a child is not reading because the child has memorized a book. You may see this in your classroom or center as children pick up a much-loved book again and again. Take a look at the video below. What looks familiar? You may see young readers mimicking your expression, the way you turn pages, or you pointing at illustrations/words. It is important to remember that these are necessary components of reading. It is our responsibility as educators to not only teach children, but to also help families appreciate the important role they play in literacy development. When families read to children, their expressive reading is a vital component of the experience. When children hear text read in different "voices" and with different pacing, this model sets the stage for future success. Not only does it demonstrate one of the five components of reading, fluency, but it also serves as a motivating factor for children. Another feature we see in this video is the use of pictures. Too often, we hear a family member expressing concern about a child's "over-reliance" on illustrations. But, we need to see the use of pictures as a valuable strategy. When a child looks at a red bird on a page and says, "red bird," it reinforces the idea that we can and should use context cues, whether these cues are pictures or words. Additionally, turning pages, moving from top to bottom, and even identifying the cover of a book are necessary skills that are demonstrated when children memorize a book. Reading and rereading a book can and will make these early literacy skills automatic. So - remember that valuable lessons are learned and practiced when children "memorize" a book. This IS reading! NAEYC - 2.E.04, 2.E.06, & 2.E.07. Head Start - VII.A., VII.B. & VII.C. What fun we have in our preschool classrooms this time of year. It is a time when we often plant bean seeds in little cups. It is exciting for children to watch their plants sprout and grow. Many of you have children measure these plants and keep track of how they are growing as they turn toward the sun. This is a wonderful way to connect math, science, and appreciation for the Earth. Always plant a few extra seeds as sometimes a child's plant does not sprout. This can be devastating. All these years later, I still remember that I was the kindergartner whose bean seed never grew. Please keep a few that you can substitute if necessary. You may want to think about planting a tray of seeds - in fact plant several trays of beans, peas, etc. You can then compare and contrast how these mini-gardens grow. This helps oral language development. It also shows children the importance of working as a class. These class "gardens" encourage togetherness. If you have the room and appropriate environment, think about planting outdoors. This will help your children observe the natural features of our environment and how these features are necessary for plants: sunshine and rain. This will add more importance to your daily weather report. Children can then discuss and describe how the day's weather will help or hurt their garden. The extension to this activity is to discuss healthy food. How do the vegetables that you grew help children grow? We know children who have started to eat beans because they grew a bean plant. Families will thank you! Additionally, you can talk about how locally grown food is fresher and also helps the environment. Share the idea that we often use trucks to bring in food from far away. When we grow food or buy it from local gardens and farms, this means that the gas from these trucks is not polluting our air. All of these points about gardens will lead to important discussions. Remember, that any opportunity to get children sharing and talking is a necessary school-readiness skill. This is also helpful for our English learners as they are exposed to content area and academic vocabulary in a meaningful way. Continuing our encouragement of getting children outside, this week we delve into using the beauty of nature to develop verbal and critical thinking skills. As an example, we share the following photos of wildflowers along with suggested open-ended questions to help you consider how you can use walks, nature, and talk to develop needed school-ready skills. Ferns can invoke good discussions. You can have children count fronds on an assigned plant and then compare their numbers. You may want to ask, "How would this feel if you rubbed it against your face?" This invokes a sense of more than a visual appreciation for nature. You might want to have children imagine they are tiny bugs. How would it feel to climb on a fern during a wind or rainstorm? This may seem like an uninspiring setting for children. But bend down and examine all that is here. Some children may describe the many colors they see. Others can predict what might be living under the dead leaves. You may even want to do a mini-science lesson about decomposing as children can then develop a sense of wonder about the cycle of life found in natural settings. What a treasure trove this plant brings to children. Ask "I wonder" questions such as, "Hmmm....I am wondering what made those holes in this plant?" Let children hypothesize. It's also a good opportunity for children to understand that you do not always know all of the answers. This can lead to a discussion about how to solve the mystery. Let children offer ideas about the scientific process as they can consider how to determine the architect of the holes. Your children will enter school thinking like scientists! This is one of my favorite wildflowers. You can ask children to describe this plant (green leaves). Discuss their guesses and then show the group how to gently lift the leaves to reveal small, gentle wildflowers thriving under the leaf. These are mayflowers or arbutus. I love the idea that often we need to consider what may be just below the surface! An important lesson for children, even if they are too young to appreciate the symbolism. They will remember the experience in later years and may use the lesson of arbutus - I did! Standards Alignment: NAEYC - 2.G.03. Head Start - XI.B.1.